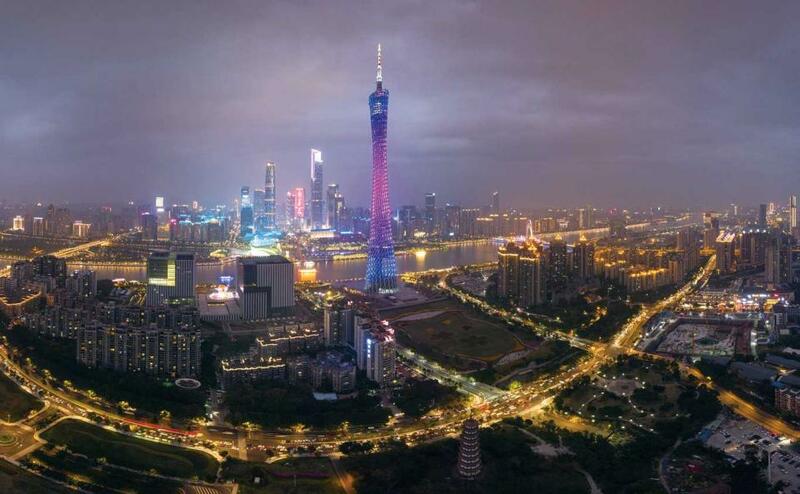 Famously known as Canton in the past, Guangzhou is one of China’s largest metropolises and the center of Cantonese culture on the Chinese mainland. While it lacks the great historical sights of Beijing and the glamour of Shanghai, Guangzhou boasts fascinating buildings, an impressive skyline and strong historical heritage. Situated along the Pearl River, the massive city of over 13 million is the capital of Guangdong Province and a key part of a vast regional metropolitan area that also includes Foshan, Dongguan and Shenzhen. For centuries, Guangzhou was a key trading port that did business with Western, Asian and Arabian traders, and after the Opium War (1840 – 1842), one of several treaty ports. As such, it is no surprise that the city remains a strong commercial center that hosts China’s largest trade fair, the Canton Fair, twice a year. Most of this commercial power can be seen in the soaring skyscrapers in Zhujiang New Town, on the northern bank of the Pearl River. But travelers have cultural and architectural reasons to start their visits in Zhujiang, because this is where several fantastic examples of modern architecture are located like the Opera House, the city library and the provincial history museum. Designed by the late, great Iraqi-British architect Zaha Hadid and flanked by skyscrapers, the gray, irregular-shaped Opera House resembles a sleek starship from Star Trek. Nearby, the Guangdong Museum is a box-shaped building meant to resemble an ancient Chinese treasure box while the Guangzhou Library is an attractive white building with slanted walls and a glass center. The museum features exhibits of Guangdong’s various peoples and cultures, Chaozhou woodcarving, ceramics, and Duan inkstones. The museum’s collection is decent but not as vast or interesting as its counterparts in Shanghai and Beijing. Right across the river is the remarkable Canton Tower which rises 604 meters into the sky. As one of the tallest towers in the world, the needle-topped tower is a symbol of the city and is probably its most recognized structure. At night, it is lit up like a multicolored canvas. Moving on from the new to the old, Guangzhou’s oldest archeological site is the mausoleum of the Nanyue King, a ruler of the ancient kingdom that ruled Guangzhou in the Qin and Han dynasties between the 2nd and 1st centuries BC. Inside the mausoleum are a multitude of Nanyue artifacts, the centerpiece of which is the jade burial suit of a Nanyue King. While the museum is built upon the site of the tomb of a Nanyue King, you do not actually see the king. And to be honest, the museum could be improved with more English information and more attractive signs and layout. Near the mausoleum is the Sun Yat-sen Memorial Hall, which commemorates the famous revolutionary who helped overthrow the Qing Dynasty (1644-1911) and is considered the “Father of the Nation.” Yuexiu Park lies above the hall, where the most well-known landmark is a statue of five goats, which refers to a legend of five deities that visited the city riding goats during a time of famine in ancient times, and then left rice, blessings and the goats behind to help the people. The park is the largest in Guangzhou and features gardens and artificial lakes. But the most significant historical remnant of Guangzhou’s past is Shamian Island. After the Opium Wars in the 19th century, foreign merchants and embassies were permitted to settle in specific districts in several Chinese cities including Guangzhou, Shanghai, Tianjin and Wuhan. In Guangzhou, Shamian, which is actually a sandbar located on the Pearl River, was given to France and Great Britain, who subsequently built settlements for their merchants. The foreign concessions have been largely preserved and the entire place is car-free, making it a rare oasis of calm. Along the tree-lined boulevards are many former European houses and buildings built in different styles including Gothic and Baroque, making it seem like a little piece of Europe in China. Besides the European houses on Shamian, Guangzhou has one of the most impressive church buildings in East Asia. Designed by French architects and constructed in 1888, the Sacred Heart Cathedral is a magnificent granite gothic Catholic building that still holds regular services in Chinese and English. With twin towers reaching up to over 50 meters and flanking the center entrance, the cathedral is one of the largest in China and Southeast Asia. While Shanghai has distinct architecture in the form of its shikumen houses and Beijing is well-known for its hutong (alleys), Guangzhou also has a distinct type of architecture in the form of qilou buildings. Unlike shikumen or hutong homes which are found in lanes, the qilou are low-rise multi-level buildings that face onto streets, with shops on the ground floors and homes on the upper floors. What makes them particularly distinct is that their upper floors extend over the ground floor, creating covered walkways in front of the shops that provide shelter to pedestrians from rain or sun. Qilou buildings were built in the early 20th century, combining Western and Chinese architectural features in several different styles. Though a large number were torn down to make way for condominiums and office buildings, qilou can still be found in several places in the city, especially in pedestrian streets such as Shangxia Jiu where some have been renovated and spruced up. The qilou give the streets a vintage look as if one was back in the early 20th century. Similar buildings can be found across Guangdong province, Hong Kong and Macao, though not in as great numbers. As the capital of Guangdong Province, Guangzhou is rich in Cantonese culture, which is reflected in the local language and food, especially dim sum. This Cantonese meal refers to various dishes such as steamed buns, rice flour rolls and shrimp dumplings that historically derived from leftovers as cheap food for manual laborers. Dim sum have since become a standard meal for Cantonese, usually at noon, which is accompanied by lots of cups of tea. While some would say Hong Kong has the best dim sum, the Guangzhou variant is still pretty good, especially since dim sum is said to have originated in Guangzhou. There is a saying that Cantonese will eat almost anything with four legs except a table, including man’s best friend, but fortunately, most locals do not do this nowadays due to modern preferences and animal cruelty awareness.